Smaller hand-held circular saw. It's design and power make it an excellent choice for tight spots. It also gives the user a right amount of comfort and control. For the times when you need to cut smaller lumber, (mainly 2x4’s,) a conventional 7 ¼ inch circular saw can be a bit of overkill. In fact, it’s actually pretty annoying to have to lug one around for such small cutting tasks. Compact circular saws are a far better alternative, as they possess all the power needed to make quick cuts of smaller materials, and you don’t even need both hands. 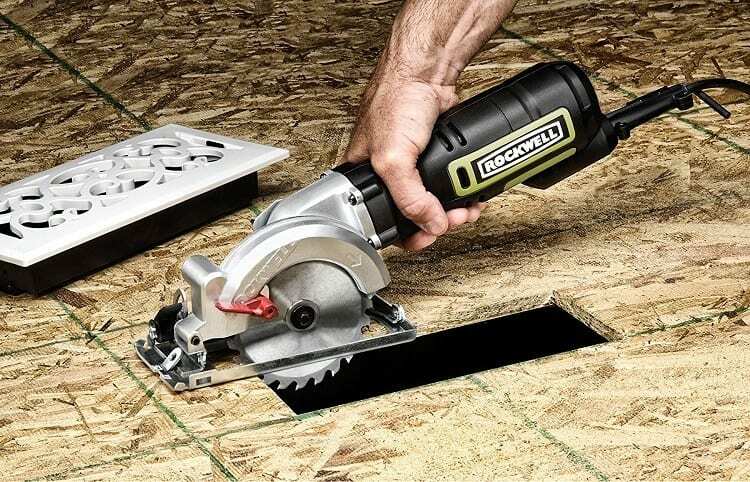 Rockwell is a popular saw manufacturer that has developed a good reputation for compact saws, and the RK3441K is a prime example. Affordably priced, powerful, and easy to use, the RK3441K possesses everything you need to get through small cutting tasks in minutes, while still ensuring the same quality of cut, just in a much smaller package. It goes even further by adding some small conveniences and extra features that merge to create one of the best saws on the market, regardless of type or size. For a small and simple compact saw, the RK3441K has a lot of features worth noting. Everything starts with the 5 Amp motor that delivers a no-load 3,500 RPM blade speed. Yes, that’s less than a standard full-sized circular saw, but trust me, it’s more than enough for the intended uses of a saw this size. Cutting through 2x4’s, particle board, and other thin wood is exceptionally smooth. The saw’s weight is very low, hovering around the 5 lb range. The weight is distributed in a way that makes it feel even lighter as if that’s possible. An inline grip design makes the saw comfortable to hold, while also ensuring better control. The balanced feel and control of the RK3441K give you better handling, so it’s very easy to make cuts overhead, or in tight spaces where you can’t fit a standard circular saw. This is great for freehand cuts during construction. The RK3441K’s 4 ½ inch blade uses a kerf that is a lot thinner than other saws. The thinner blade allows for easier cutting, while also keeping the blade cooler, avoiding a common problem with basic compact saws. The saw’s left-handed blade design offers improved cut line visibility. Blade changes are made easier thanks to an arbor-lock button, and an easy-set depth gauge lever allows for quick setup and cutting adjustments whenever needed. The RK3441K also has a dust port with an available vacuum hook-up, so you have the option to keep your work area and cutting line cleaner, should you desire. Also, when buying new, the RK3441K comes with a 3-year limited warranty. Quite a few things to admire here, as the RK3441K does a lot of things well. The 5 amp motor is actually a little stronger than what you usually see with this size, and when combined with the smaller kerf, this translates into a superior cutting ability that doesn't require a ton of force. When cutting thinner materials, this is even more evident. The weight distribution of the motor and handle creates a balanced feel, while also letting you easily freehand cuts overhead, to the side, or really just about anywhere else. This is crucial in a compact circular saw, so it’s good to see Rockwell place added attention on this. It's also very easy to switch to bevel cuts up to 45 degrees, which makes the RK3441K even better. Nobody likes having to mess around with adjustments on the fly. As with any saw in this price range, there will be a few complaints. One puzzling aspect of this saw is where the trigger is located in proximity to the safety switch. They are too far apart. It would be better if the safety switch was located just above the trigger instead. Hopefully, Rockwell fixes this on future models. The saw’s shoe has a little bit of wiggle in it, making it feel unstable when you really need to get an accurate and straight cut on larger materials. There’s actually a DIY fix you can find for this online if it bothers you. If you’re cutting through a 2x4 made of harder wood, there may be a little bit of wiggle from the saw when you first start cutting, so be aware. You just need to exert a little more effort at first to keep things nice and straight. No compact circular saw can be considered professional level per se’, but I don’t see any reason as to why contractors wouldn’t love having this available on the job site. It’s incredibly light and easy to transport, so it’s one of those saws you can just leave sitting around in the truck when needed. That said, if it's good for contractors, it’s definitely good for the average user that needs an economical circular saw for smaller tasks. This is about as cheap and easy as it gets in the power saw world, and the RK3441K makes a fine addition to any shop lineup. The RK3441K does about all you can ask a compact circular saw to do. It’s light, powerful, easy to handle and maneuver, and still has many of the same angles and adjustments found with a standard circular saw, just in a smaller package. While this saw can’t do everything, as long as you stay within the frame of intended uses, you’ll be more than satisfied with how it handles everything. The Rockwell RK3441K may be a little pricier than other compact saws in its class, but believe me, it’s definitely worth it.